The KING of steaks! A 14 oz. Choice strip steak hand cut from the finest beef, charbroiled to your liking. The juiciest of steaks, well-marbled for superior flavor and tenderness. Lightly seasoned and charbroiled to perfection. Satisfy your appetite with this 8oz thick & juicy Choice center cut sirloin, chargrilled just the way you like it. The most tender and juicy 8 oz handcut filet, chargrilled for a beautiful finish. Slow roasted to fall off the bone tenderness and dripping with our famous recipe BBQ sauce. So delicious a half rack won’t do! Breaded in Italian breadcrumbs accented with lemon butter and grilled over an open flame for a great taste treat. Lightly dusted in seasoned flour and sautéed golden t Finished with a spritz of lemon, capers and a splash of white wine. Sundried Tomato, Dill Alfredo or Teriyaki Glaze. Jumbo shrimp battered and fried served with a side of Fries. This delectable mild flavored fish is lightly battered and pan fried to perfection..
A mouth-watering chicken breast marinated with olive oil and lemon juice, breaded and grilled over an open flame. Tender chicken breast dusted in flour, sautéed with olive oil and fresh mushrooms and splashed with Marsala wine. A memorable meal, grilled Italian sausage links made from freshly ground meat and seasonings, hand stuffed by our chef and covered in peppers, onions and tomato sauce to arrive at a favor you can't find anywhere else in the area. 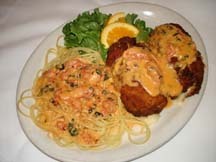 Lightly breaded breast of chicken baked with a zesty tomato sauce and melted mozzarella cheese. Served with a side of spagetti, sorry, no potato. Add steamed vegetables for only 1.99 more. Stuffed with a blend of cheeses and capicola ham. covered in Italian bread crumbs and baked. Served with a side of spaghetti in a creamy tomato sauce (no potato or vegetable). 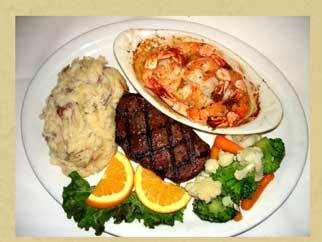 A juicy 8oz sirloin paired with your choice of shrimp scampi or fried shrimp. A tasty combination of Italian favorites, meat lasagna, fettuccine alfredo and sicilian chicken. An 8oz top sirloin grilled to perfection, accompanied with a 1/4 rack of our BBQ Ribs. Our huge burritos are made authentic with your choice of meat stuffed into a flour tortilla,covered in our homemade sauce and colby cheese, then baked until bubbling. Served with salsa.